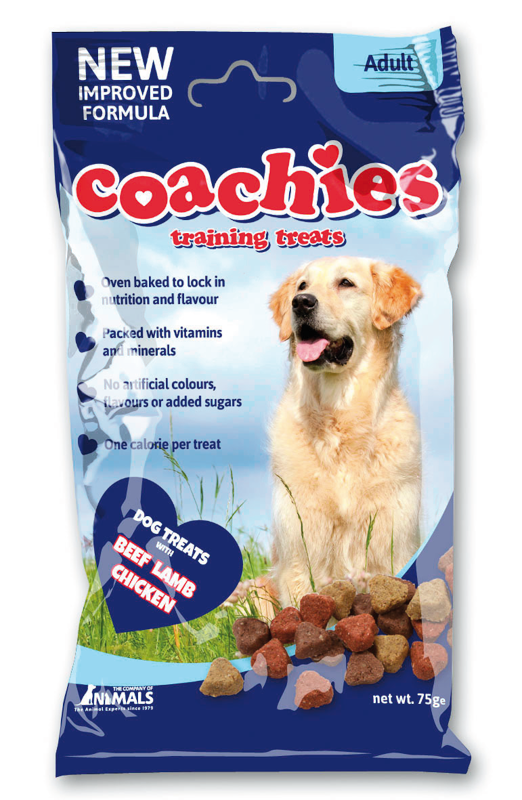 Coachies Training Treats have been a favourite among dog owners for 10 years and now they can continued to be enjoyed with our new improved recipe. The treats are oven baked to lock in nutrition and flavour and with no artificial colours, flavours or added sugars making the New Coachies Training Treat the healthiest way to train your dog. These tasty miniature motivators are perfect for use in reward based training. Ingredients: Wheat, Beef Meal (14%), Glycerine, Lamb Meal (4%), Poultry Meal (4%), Fats, Yoghurts, Whey Powder, Minerals.